CW3E is helping to understand the critically important role that extreme weather events play in shaping climate in California and other regions of western North America. The CW3E climate theme is centered around understanding the benefits of extreme weather events, such as in delivering water supplies, and also the hazards they create in causing floods and debris flows. CW3E research focuses on characterizing extreme events in the West including storm types, frequency, intensity, duration and variability through the careful examination of historical data from weather observing stations, satellites, reanalysis data sets and cataloguing big impact events. An additional component of the research examines extreme weather events in global climate models to understand how these events are projected to change in the future. Much of this work is done in collaboration with CNAP, California Nevada Applications Program (cnap.ucsd.edu), a NOAA sponsored RISA team, some of whose core members are also located at Scripps. Lamjiri et al. 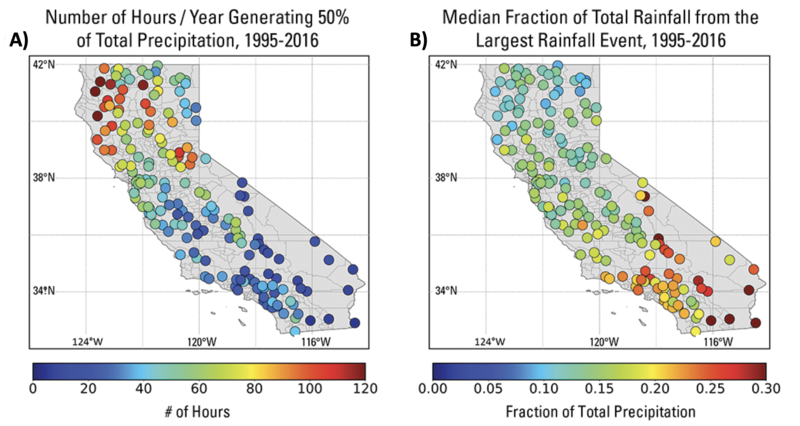 (2017) showed that duration of a storm event generally has more of an impact on total precipitation than intensity along the US West Coast as compared to other parts of the US. Figure 2 (from Lamjiri et al., 2017). Spatial map of Pearson correlation coefficients illustrating the connection between storm precipitation total with storm duration across the US. Dettinger et al. (2018) showed that strong atmospheric rivers (ARs), with maximum integrated water vapor transport values of 1000 kg m-1 s-1, have a return interval of ~2 years at 45˚N, ~3 years at 40˚N and ~10 years at 35˚N. Polade et al. (2017) studied regional climate projections from more than 30 global climate models, finding that in future decades, California will likely experience decreased frequency of winter days with any amounts of precipitation, but an increased intensity during events with extremely heavy precipitation amounts. Guirguis et al. (2018a) showed how certain circulation patters are more favorable to ARs making landfall at various locations along the West coast of North America. Guirguis et al. 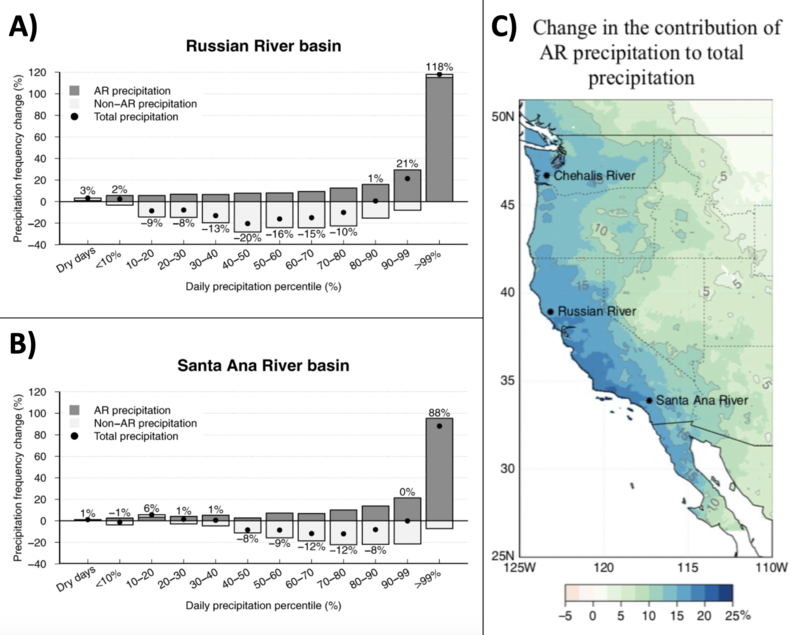 (2018b) showed how the interaction between different modes of climate variability influence important characteristics of ARs making landfall in Northern California including synoptic evolution, orientation, and precipitation. Oakley et al. (2018) showed that rainfall rates that exceed thresholds known to trigger landslides are associated with ARs 60-90% of the time and are most common in the Transverse in southern California and Coast ranges in northern California. Figure 2 (from Oakley et al.,2018). Marker size indicates the number of over- threshold precipitation events for months of October–May from 1995–2015. Percent of events associated with ARs are represented by marker color for (c) 15 mm per hour threshold, and (d) 20 mm per hour threshold. AR catalog ends in 2015; thus, 2016 could not be incorporated. Pierce et al. (2018) and Kalansky et al. (2018) assessed regional and local climate changes and found that under projected precipitation regime shift over California and San Diego County toward having fewer precipitation days, there will be a tendency toward more dry years. CW3E climate research is focusing on the mesoscale dynamics that are associated with high rainrates and long duration storms. CW3E has also begun to examine the North American Monsoon and the climatology associated with extremes in the northern monsoon region. In addition, CW3E is examining how ARs are projected to change in the future and how this impacts annual precipitation changes as well as the most extreme precipitation event in the future.